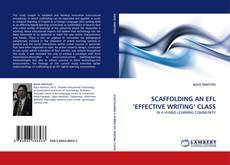 This study sought to establish and develop innovative instructional procedures, in which scaffolding can be expanded and applied, in order to enhance learning of English as a Foreign Language (EFL) writing skills in an effective hybrid learning community (a combination of face-to-face and online modes of learning) at the university where the researcher is working. Many educational experts still believe that technology has not been harnessed to its potential to meet the new online characteristics and trends. There is also an urgency to reconsider the pedagogical perspectives involved in the utilisation of online learning systems in general and the social interactions within online courses in particular that have been neglected to date. An action research design, conducted in two cycles within a duration of four months, was utilised throughout this study. It was intended not only to achieve a paradigm shift from transmission-absorption to socio-constructivist teaching/learning methodologies but also to inform practice in these technology-rich environments. The findings of this current study extended earlier understandings of scaffolding in an EFL hybrid learning environment.